So, you've had a baby and are now caring for it constantly. 24/7. 100% of the time. Even if your husband is helping as much as he can and you have family nearby, all of your focus is likely on le petit bébé, which is totally understandable. Let me also just quickly remind you that you have just put your body through an extremely overwhelming experience. You need to take care of you too, mama. 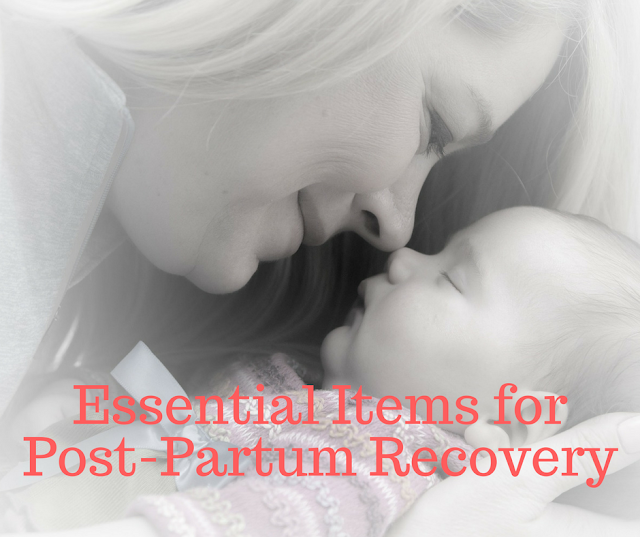 It was nearly two years ago, but are the things I found most useful to help me with my post-partum recovery. 1. A Sitz Bath - I was able to borrow one of these from a friend, and it was great. I just added warm water and tried to sit on it for 15 minutes 2 or 3 times a day. Usually it was 10 or 15 minutes when I knew someone else was taking care of Seb, and I got a few minutes alone, but sometimes I did it while nursing if that's what worked. 2. Earth Mama Angel Baby Mama Bottom Balm - I used this balm to help heal my episiostomy. It was cooling and also helped with any post-partum hemorrhoids. This company is wonderful because they focus on creating products for mamas and babies that are gentle and natural which is exactly what my body needed right after giving birth. 3. Earth Mama Angel Baby New Mama Bottom Spray - I have no idea if this spray did anything to help the healing after birth but it smelled lovely and felt nice, so I liked it. 4. Tucks - I went through one box of these during the post-partum recovery days. Soaked in witch hazel, they were another key item to have in stock after birth. 5. Betaderm - I may get a little heat on this one, but I'm putting it out there in case it helps someone. About a week after S was born, I got PUPPS. Imagine the worst, burning, itchy body rash ever covering your arms, legs, and stomach. PUPPS affects about 5% of pregnant women, and you can read how my cousin-in-law dealt with PUPPS while pregnant here. I was the lucky one who got this after Seb was born which, according to my dermatologist, is extremely rare (and the last thing I had energy to deal with having a newborn at home). He prescribed Betaderm. It finally offered me relief, and I was still able to nurse while using it. (I am starting to recover from it in the pic above, but if you look closely, you can still see a bit of how this rash had covered my arms). 6. Water, snacks, and a Kobo or Kindle - These three items were essential while nursing! 7. Sleep - I spoke a bit about how I struggled with the lack of sleep post-partum here. I know it's hard, but without a doubt, sleep is something that will help your body, and mind, heal after giving birth. Do what you can to try and get some sleep.